First of all, please pardon how messy and sketchy things are in this post. These are much looser then I'd like to be showing! But I always enjoy peeking into people's minds when they're generating ideas. So I figure it's only fair to bare a bit of mine to you guys! Here are a few doodles I managed to scribble out over the course of the last week while creating ideas for an monthly art challenge with some friends of mine. We're hoping to produce a piece of art, monthly, based on a random theme. This month the image just had to include a "Space Princess". So while everyone seemed to be interested in drawing pin ups, I decided to take it another direction! I knew I wanted to my Space Princess to be a little girl. So here you can see some of the many scribbles where I explored what she might look like. I loved the idea of her hair being wild and frizzy. I also thought it was kind of a fun idea to have her hair bunch up and spill out of the bottom of a space helmet. Ha! Still not sure where I'll go with her design completely but these at least helped me understand what direction I'd be moving in. The little thumbnails included are indicators of the image I sort of had in my head. I thought about doing an angled shot with the two alien guards on either side of her. That way we could see her lording over all of her alien minions below. But I think I'm going to go with the more simplified straight on composition with her thugs at her side. I felt pretty confident about where it was all headed but I wasn't sure what I wanted the aliens to look like. Which prompted these sketches! During the week, when I had a free moment, I'd scribble out some random design with no real thought other then it needed to be wacky. I just played around with shapes and silhouettes. I kept coming back to tentacles for some reason. I still don't know which one I'm going to choose and push forward in the final illustration. I'd love it if you guys would help me to decide! Leave me a post in the comments with your thoughts! And anything I don't use might make for good starting ideas for some of the aliens in my Zebzulon project! Ha! As the week goes on I'm going to dive into the illustration and hopefully start painting by the time this weekend gets here! Hope you guys like the messy look into my mind as it tries to rough on ideas! See you again soon! Those of you who have bought one of the first twenty of my Hellboy prints will find that you will also be getting a quick sketch from me as well in your package! 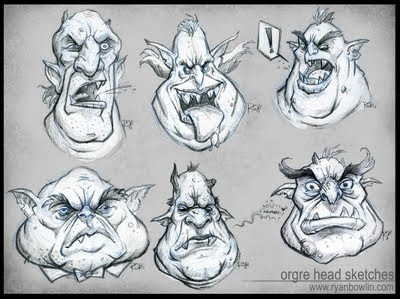 I just did a few Ogre head sketches for each person to include as a personal thanks for the support! I hope you guys like 'em. They were really fun to doodle out! I've only sold six prints so far. 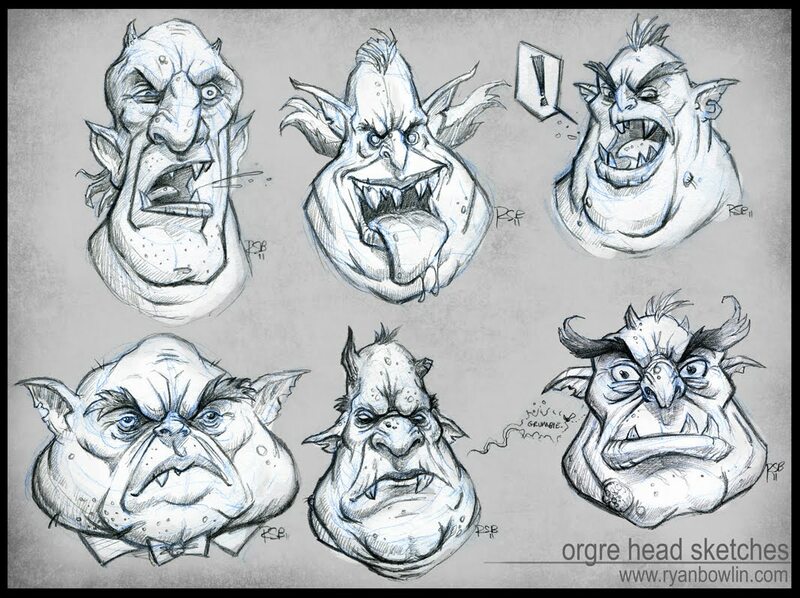 So make me work even harder and draw 14 more Ogre heads! Ha! And I hope those of you who picked up a print already will enjoy this little additional gift! Thanks again! As for other art, I'm still crafting some things for another little project that a few friends and I are doing monthly. This month's theme is "Space Princess." So I should have some posts regarding that in the coming days. I don't have much time left! Ha! So this week should be interesting. It might bleed into next week a bit but stick with me! Hope you guys are doing great. Thanks for checking in! Overall I'm pretty happy with it! I worked on it off and on over about three evenings. Her face seemed to come really easily but Shawn had such a fun look on his face that capturing his likeness was much tougher. I'm not a hundred percent satisfied with how he turned out. But I think I did get it close. 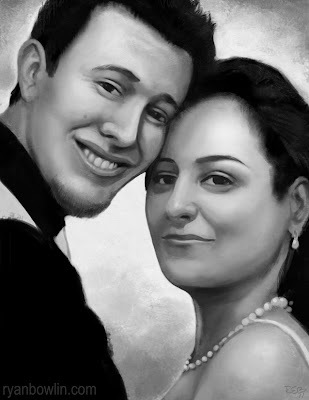 And as far as portraits go, I think this is one of my best digitally painted portraits so far. So that's what has been eating most of my free time the last few days. I have some scribbles that I'll probably offer up in the days to come. Thanks for looking! Hope you like it! Hellboy Limited Edition Prints Now Available! 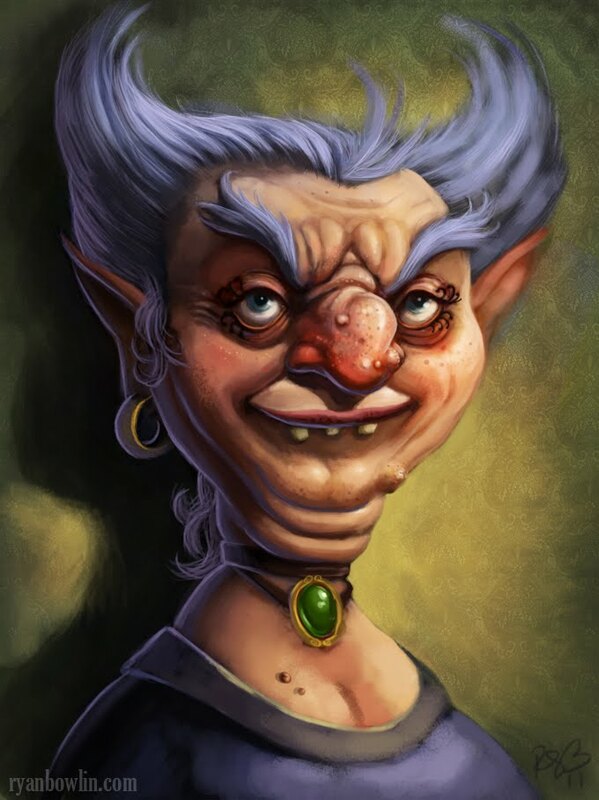 Those of you who are familiar with my blog will remember the Hellyboy portrait that I posted a couple weeks ago. I went and had these guys printed and they are now available for purchase via my shop on Etsy. What are the specs, you say? They're a thicker, matte paper stock that measures in at 9.5 x 11. They look so nice I'm not even sure I want to sign them on the front. Ha! Sorry if I'm beating a dead horse. I'm just kind of excited to have nice hard copies of my work to share with the world!. That's all for now! I've been spending some time lately trying out new processes for drawing and have gone back to trying the col-erase pencil method. I've never liked those pencils much because it always felt so waxy to work on top of. But this week I came across some Prismacolor col-erase pencils that seemed to work much better. I'm hoping that this will help free me up to be really lose in the gesture steps of my work. So far it's been really fun and I think it's helping! I always tend to get tight to quickly. So out of those scribbles came this Wolverine doodle. I've actually never drawn him before. So most of this is from memory and I've added my own changes for the heck of it. Last night I sat down with my sketch and tried tossing some color at it. I was looking for a treatment similar to my Harry Potter sketch from last week but I had terrible go with it. The painting just got away from me and I spent hours trying to get back the personality I'd captured in my sketch. So when I finally "finished" the painting today I decided to scrap it. Ha! I hated it. 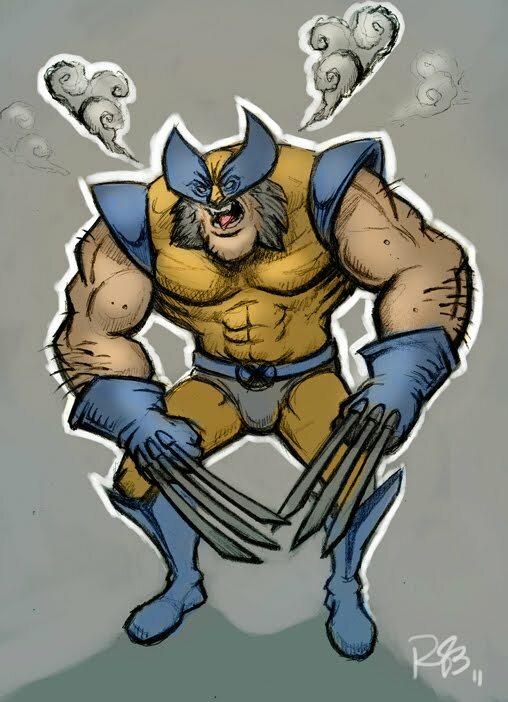 I'll still be trying to tackle a paint up on ol' Wolvie but I just wanted to share my sketch with you guys to let you know I'm still around and kicking! I should have a fully painted version in the coming days so be on the look out! I've got some other things I'm batting around too so be sure to check back in for more updates! Timely updates to the blog! It's nice for a change, eh? Here's a sketch I did a couple months ago that I intended to finish but just lost interest. I figure there's enough in there that it shouldn't just go to die on my hard drive somewhere. I had considered doing these almost like portraits on their mantle. I even had drawn up a pencil sketch of her goofy husband to go with it. I thought it'd be really funny to have a third of their son who looked completely normal. Ha! Maybe someday I'll see it through but I've too many other things on my plate for now! So Edna will have to make herself comfortable here for a while. 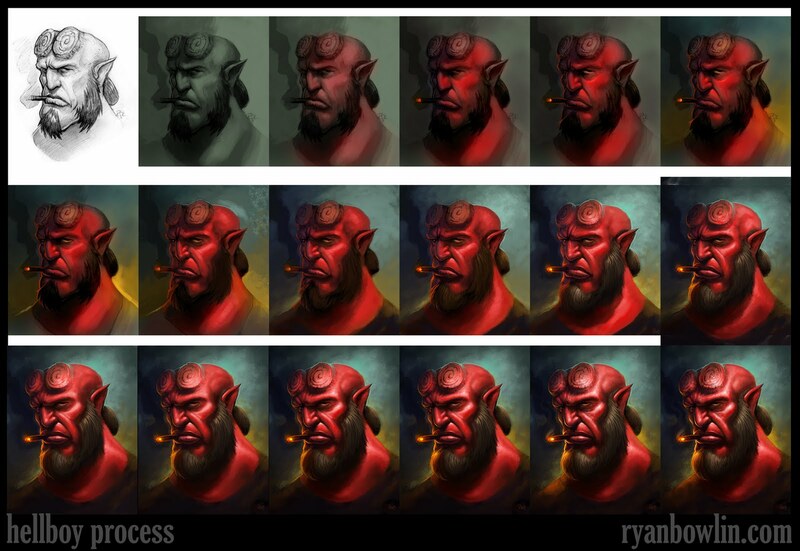 And as promised, here is the a step by step progression of my Hellboy piece for your viewing pleasure. I don't know that you'll find much help here though. The next time I create a more simple illustration maybe I'll try to work better in steps and walk you through the process a bit better. But you might be able to glean some information from this. I hope it's helpful or at least fun to see how the piece evolved as I worked. Thanks for checkin' in! More sketchery to come! PSS: Hellboy Limited Edidion Prints are still available on my Etsy shop! Check 'em out HERE! So yesterday I was thinking about other potential illustrations for the future and I started thumbnailing some potential compositions for a Harry Potter themed image. 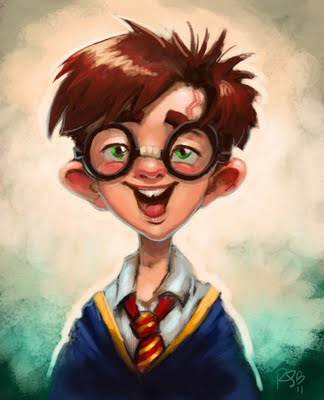 It got me curious what my version of Harry might look like. So I did a few quick pencil sketches of some fun versions of Harry. And I thought this one was too cute not to toss some color on. Just about and hour or two in Photoshop. Plus I figured I owed you guys something cute since I might have scared some of you off with my big, ugly Hellboy image. Ha! Hope you like my scribble! In the next couple days I post the Hellboy "process shots" that I promised. Until then, thanks for stopping by! 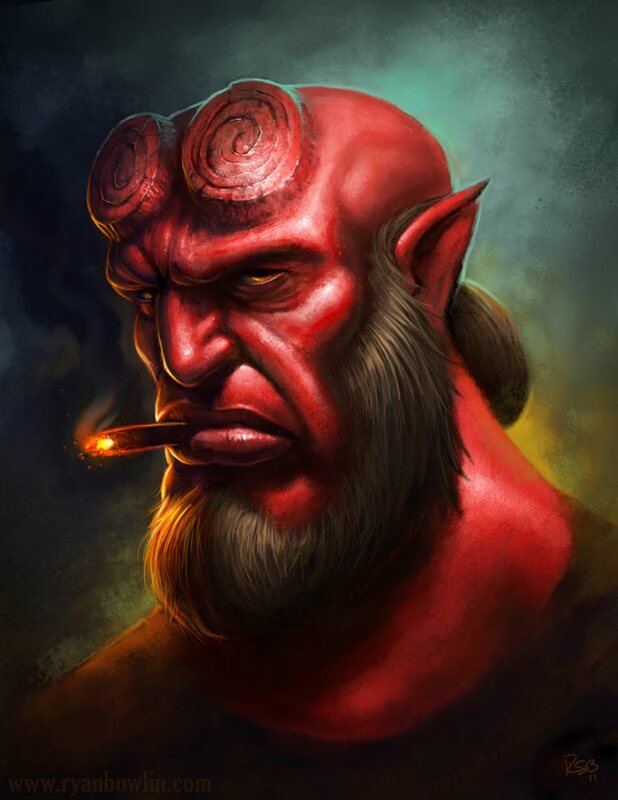 I recently finished up this portrait for the infamous Hellboy. Overall I'm pretty happy with him! It was kind of a test/study for a larger piece that I've been intending to do with him as the main feature. After having some successes here I'm looking forward to working on the next one! Hope you guys like him! I'm also considering doing a small limited print run on this if there is interest! So let me know in the comments. It'd probably be a bit larger then 8.5 x 11 and would run probably $20 plus shipping. Next update maybe I'll show a bit of the process of how I got to this finished illustration. I always love seeing the start and what it took to get the art to the finish. ;o) Anyway, thanks for looking at my work and take care! EDIT: If you're so inclined you can now preorder/purchase a print of this image through my shop on Etsy! I'm only doing a very limited print run so get 'em while you can! Thanks for supporting my art! Everyone keeps blabbing about Shark Week so in honor of this momentous occasion I present to you GLOW SHARK! 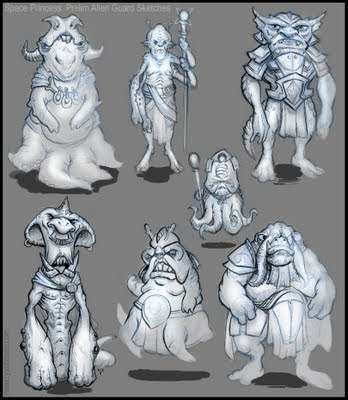 lol This guy was a concept for a creature that was to appear in a axed MMO that I worked on last year. May he live on forever in your nightmares as a glowing predator in the dark, murky waters of your dreams! In other news, contrary to popular belief, I'm not dead! ;o) It's been nearly a year since I've updated this thing and I'm going to try and make another push to be better about updating again. Lots of work and life happening. More to come soon! I promise! I mean it this time! Ha! Thanks for checking out my scribbles!